Attributed to its versatile design, the RA1181 lets you work with a variety of materials while ensuring precision with every cut. With a tall aluminum fence measuring 4-7/8 inches in height by 25-1/8 inches in length, the table handles tall stock with ease. The fence also features adjustable MDF face plates for better support and smoother operation. The rigid aluminum router mounting plate provides accurate cuts and it is pre-drilled to fit a variety of routers, for added versatility. The easy-to-use featherboards attach to the fence and table. They are adjustable to fit a variety of work pieces. They also provide additional support and control while feeding stock across the routing table. The Bosch RA1181 benchtop router table features a dust collection port in the fence that accepts standard 2 1/2-inch hoses to connect to a dust collection system or shop vacuum. The 3/4-inch by 3/8-inch accessory slot can be used to add additional featherboards as well as optional accessories, such as miter gauges. 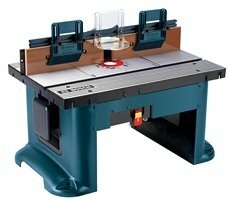 The RA1181 benchtop router table measures 27-inches wide by 14 1/2-inches high by 18-inches deep and weighs 30 pounds. It has a maximum fence opening and a maximum throat opening of 2 5/8-inches, and accepts router bits up to 3 1/2-inch in diameter. Since the Robert Bosch Tool Corporation was established in North America in 2003, the Bosch brand has become synonymous with engineering excellence. The power tools division of Bosch continues to be a pioneer and world market leader for power tools and power tool accessories. Their core success factors are innovative strength, new product launches, and pace of innovation. Bosch is every professionals go-to brand for power tools that will last a lifetime. This Bosch product includes: one RA1181 benchtop router table, a set of three mounting-plate insert rings, router mounting hardware, dual-outlet 15 Amp switch with overload protection, two adjustable featherboards, adjustable clear guard, starter pin and guard, and two 1/16-inch outfeed fence shims. It is backed by Bosch's one-year limited warranty, 30-day money back guarantee, and one-year service protection plan.